Freshman, Brittany Kahn smashed the meet-record in the 500-yard freestyle by over four seconds with a 4:55.67 at the Trinity League prelims Saturday. Kahn’s time ranks second in the county. 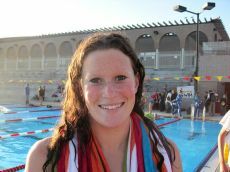 Congratulations to Brittany and the JSerra Swim team, for their second athlete of the week for the 2012 season.